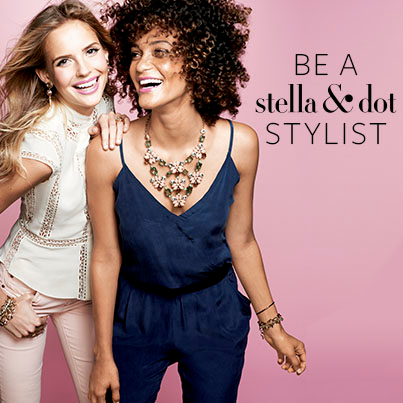 I am excited introduce Stella and Dot Stylist Laurie Syphard to you! This is the second time I have worked with her to show off Stella and Dot’s latest trends – and I love this candid view of her life as a stylist. I have personally considered working as a stylist, and I was excited to “sit down” with her and ask her these questions. Laurie is super down-to-earth, and her thoughts on this home business are so refreshing! Make sure you connect with this girl – I know you will love her. Laurie is having a Rewards Giveaway show online! Anyone who places an order will be entered to win all of the hostess rewards from the show, which she’ll be announcing on Valentine’s Day. Place an order here and be qualified! 1. Tell us a little about yourself! If you could describe yourself in five words, what would they be? 2. Let’s meet at Starbucks. What’s your drink? Yes please! I’ll take a grande non-fat chai. 3. Did you love jewelry before you started with S&D? What are your daily go-to pieces? I had a pretty sizable collection of jewelry before I started with Stella & Dot, but it was pretty limited in terms of style – all silver; no gold. I had a lot of sterling silver and leather bracelets and necklaces with funky pendants, so I’d say my styling pre-S&D was pretty eclectic. My go-to pieces have always been my wedding bands and pearl stud earrings, but now I change it up on a daily basis with S&D layering necklaces, stackable bracelets, and scarves. I love having so many options with my Stella & Dot samples in my home office! 4. 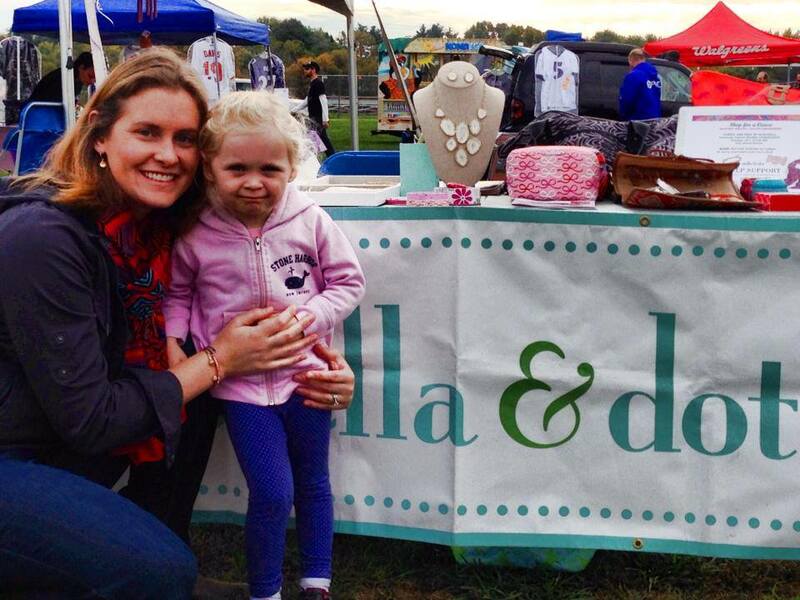 How did you get started with Stella and Dot? What drew you to this business? 5. How much work is being a stylist? I mean, is it an 8-5 job? Do have “office hours”? It’s definitely not your typical 8-5 job, which is the main reason why S&D really works for me. My “office hours” are several weekday mornings (while my daughter is at preschool) and several evenings (when I do trunk shows) per month. The best part about the scheduling is that I can modify it per month, depending on what else I have going on. Some S&D stylists choose to work more than I do, and others choose to work less – it all depends on how you want to manage your own business. Flexibility is key. 6. What is your favorite part of the business? Has any part of it surprised you in a good way? My favorite part of the business is sharing Stella & Dot with other women while I’m out and about and at trunks shows. I also can’t tell you how many other Stella & Dot stylists (and now friends!) I’ve met through my journey with this company. Everyone involved in Stella & Dot is super supportive of one another and it’s been such a positive part of my life since I’ve joined. 7. What is your least favorite part? Did you have any fears when you started being a stylist? I was definitely apprehensive about “putting myself out there” when I first started, especially since I had no sales experience and was literally going to be building my business from scratch. I also wasn’t too comfortable speaking to large groups of people, but within my first few shows, I became really comfortable at it and my confidence soared. I started doing trunk shows for friends and family and quickly branched out to doing shows with all new faces, and it’s been a great for me socially. 8. What’s your most favorite piece of current S&D earrings, ring, bracelet, necklace, accessory? 9. What would you say to someone who is making the decision about becoming a stylist? What good advice can you pass on? You have NOTHING to lose and SO much to gain!! If you’re at all curious about the opportunity you should totally ‘try it on for size’ and see what you think. Even if you decide it’s not for you in the long-run, you’ll walk away knowing you gave something new a shot and with $350 in free accessories that are yours to keep! If you’re looking for a flexible business opportunity that you can really tailor to your life, Stella & Dot is here waiting for you! Now, a few questions just for fun! Downton Abbey, hands-down. I’m completely obsessed! I’m very low-key when it comes to beauty products, so my favorite product is Dove Beauty Bar for Sensitive Skin. I bring a bar with me whenever I travel! You have a free Saturday – what would be your ideal day? What celebrity do you admire for fashion/jewelry? I enjoy seeing what celebrities wear to various events but I really don’t follow anyone in particular for fashion or jewelry… I actually follow several different Stella & Dot stylists on Instagram and Facebook and pick up ideas from them! It’s fun to see how other stylists wear their S&D pieces. What is one quirky fact that most people don’t know about you? I have a three-legged cat that I rescued at the beach when I was in college. She’s still going strong at 13 years old! Make sure you follow Laurie for updates on the latest pieces!